Every second counts in an emergency. Whether there’s a building fire, a person stuck outside in the cold, or a car crash, how quickly first responders arrive determines the outcome. Improving response times can limit personal harm and property damage, and even save lives. Technology has eliminated countless inconveniences from daily life: catching a cab, waiting in line at Starbucks, splitting the bill with friends. When a person experiences one of the most difficult moments of their life and dials 9-1-1, they still face a list of challenges, starting with relaying their location. Technology can and should remove these obstacles for faster and more effective emergency response. In the video below, public safety experts and former 9-1-1 dispatchers join our CEO Michael Martin to explain their vision for Next Generation 9-1-1. The modern 9-1-1 system was designed over 50 years ago for landlines. Emergency responders knew a caller’s location from their registered address. Now over half of US households rely exclusively on cell phones, resulting in 180 million mobile calls to 9-1-1 each year. The typical cell phone call to 9-1-1 doesn’t transmit precise location data quickly, forcing the 9-1-1 dispatcher to rely on a verbal conversation, the location of the closest cell tower, and eventually GPS when available. Researchers from the Harvard Data Science Initiative have found that making precise location information available to 9-1-1 can reduce response times by seven minutes. What does seven minutes mean in the context of responding to a 9-1-1 call? This shorter response time results in a 20 percent reduction in damages from building fires, a seven percent reduction in healthcare costs, and, most importantly, a two to ten percent reduction in mortality for life-threatening medical emergencies. Because the current 9-1-1 system is unable to receive rich data, millions of families spend between $20 and $60 a month for roadside and home safety assistance that require call centers to verbally communicate data with 9-1-1. Beyond location, there is a wide range of contextual information that can be useful to first responders. Currently 9-1-1 relies on verbal conversations as the source of situational information to prepare first responders when they arrive on the scene. Speaking under the duress of an emergency can be difficult or even impossible. A caller may not know their location, much less the telematics data of a car crash or the smoke density inside a burning building. Internet of Things sensors, wearable health devices, and connected cars collect sophisticated data from their environments. The NG will make this data available to first responders. 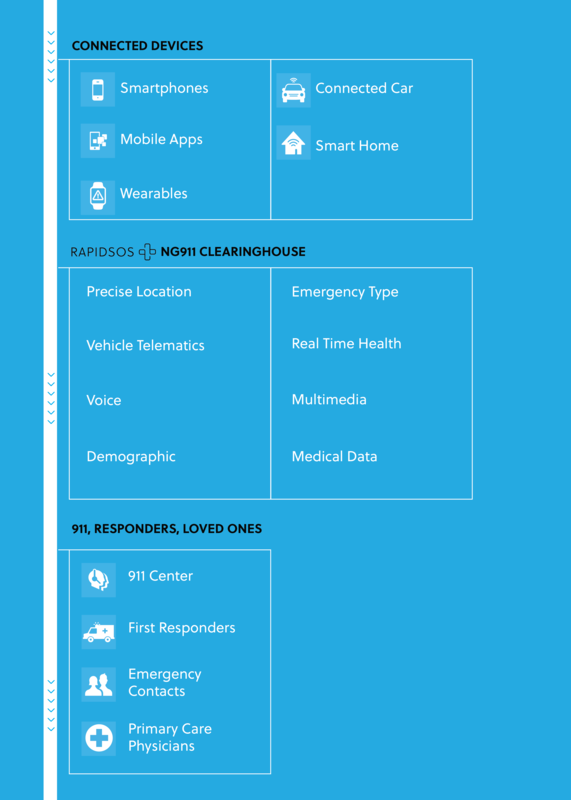 Real-time, situational data automatically shared with 9-1-1 can help responders arrive faster and better prepared. For example, a smart car can notify emergency services of the speed at the time of a crash and whether airbags deployed, allowing them to respond quickly with appropriate care. A connected health device can alert 9-1-1 of a fall and supply demographic data on the wearer. If you’d like to see the platform in action, sign up for a demo and our team will reach out to you.